The functionality of online chat allows amoCRM users to exchange instant messages with their customers. At the same time, clients use the messenger for their communication. As a rule, only the client can initiate correspondence. The amoCRM API allows developers to integrate various instant messaging channels. 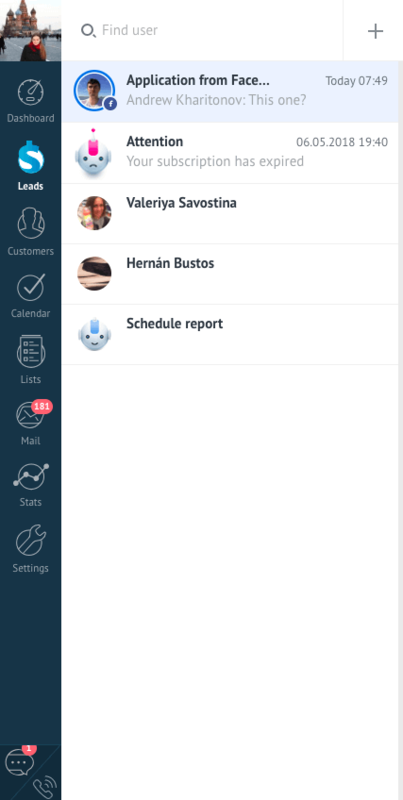 For the end user, the work in the amo interface with such channels will not be different from the already built-in CRM (vk, facebook, telegram and so on). The developer can make the integration only for his account, or replicate the solution to all amoCRM users via a widget. 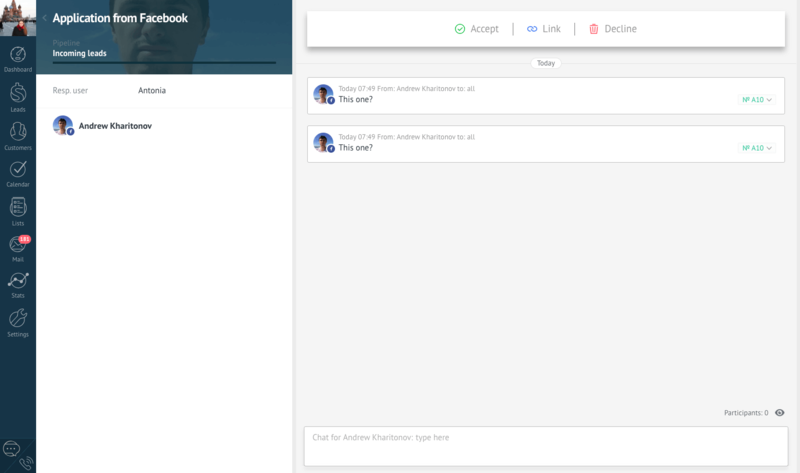 Webhook URL, to which messages from amoCRM will be sent. The URL must be of the form https://domain.com/location/:scope_id. Marker :scope_id will be dynamically substituted by the system. With it, you will be able to identify from which account the message came. The list of accounts (customer number) that will be allowed to work with the new channel. Email for communication in case of errors. Do you plan to replicate the solution to all amoCRM users? Is there already a similar solution in amoCRM? If there is such a solution, what is unique about yours? 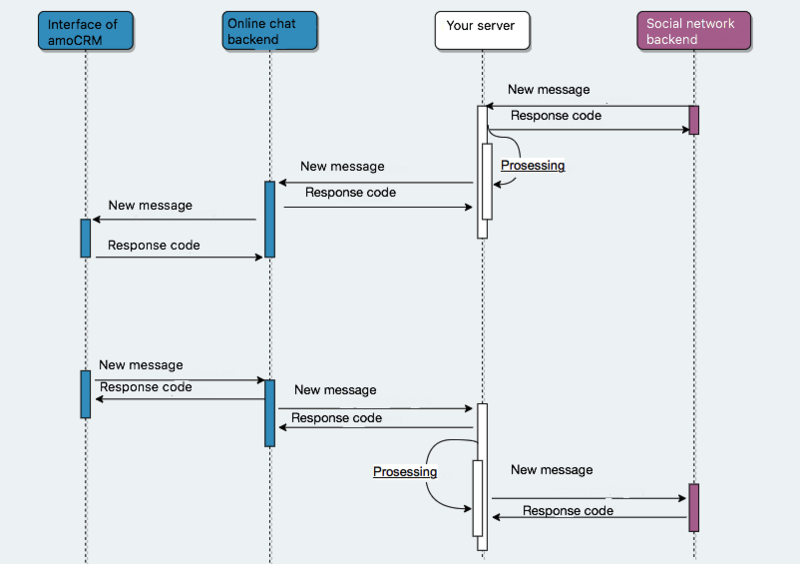 In the answer you will be sent the parameters of access to the API of online chats. The period for consideration of applications is 1-3 working days. To work with the service you need to get a unique account ID. It is different from the customer number. You have access to us from us. It's time to connect your account to a new channel. We create a POST request, which specifies the account ID to connect to our channel. You can send messages of the following types: text, image, file, location, contact. Any employee who has access to the incoming lead card can look at the correspondence and respond to the client. Once the amoCRM user has responded to the client, a POST request with the message data must arrive at the callback URL. You can give other amoCRM users the option to add your channel to your account. To do this, you need to develop a widget, through which the user will be able to link your account with your channel. 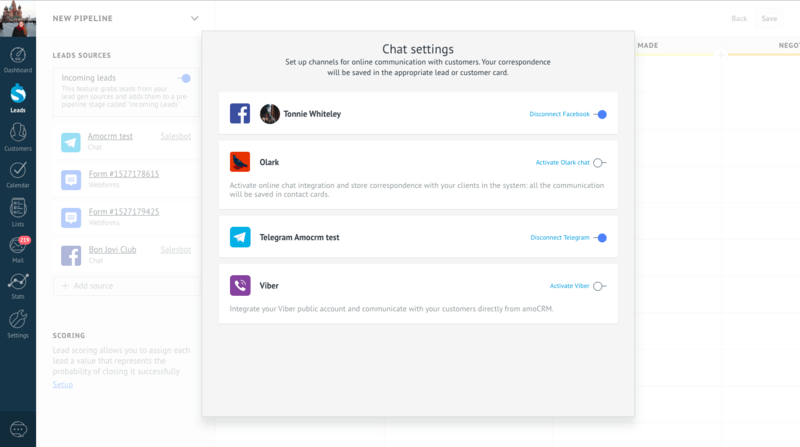 Your server validates credentials and prompts you to connect a new account to the chat channel.